You'll probably hear me say “low cost, high impact” (LCHI) a lot in this blog. Discovering something is LCHI is one of the many highlights of my job. Who doesn’t love an item that is worth a lot more than the money you spent to purchase the item?! 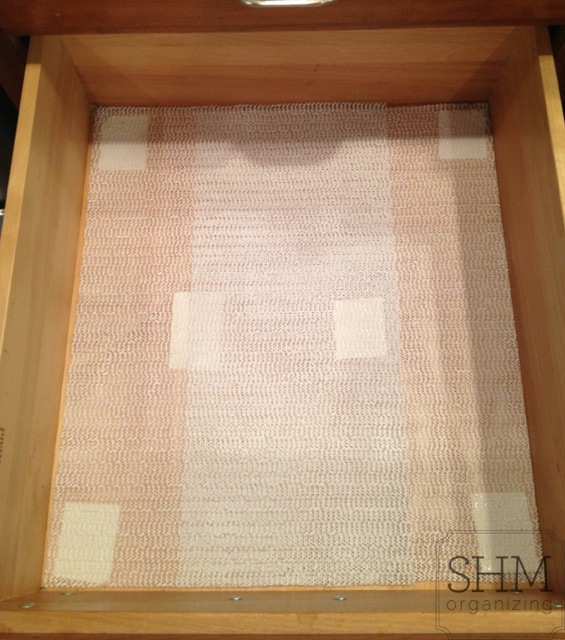 My latest LCHI obsession is a non-slip drawer liner. You can find such liners, in various sizes, at your local dollar store. I view drawer liners as functional, rather than fashionable. In other words, if your shelves are stain-free, solid (not ventilated), and hold non-fragile objects (like everyday cups or plates), then there’s really no need to spend hours cutting liners to perfectly fit these areas. 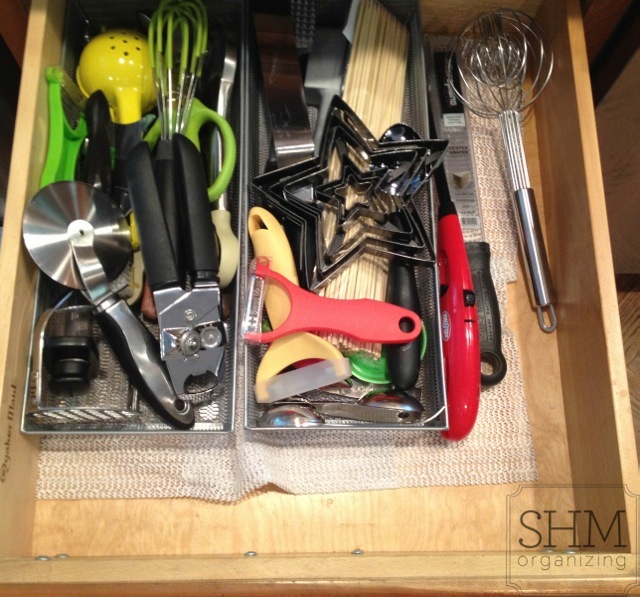 However, non-slip liners are essential in utensil drawers, [organized] junk drawers, and other areas where stability is needed. Hearing your kitchen supplies rattle around each time you open a drawer is simply unnecessary. I’ve found the most common remedy that is recommended for this scenario is spray adhesive. But as you can imagine, that leaves a big sticky mess behind in your drawers or on your shelves. So, I recommend carpet tape. 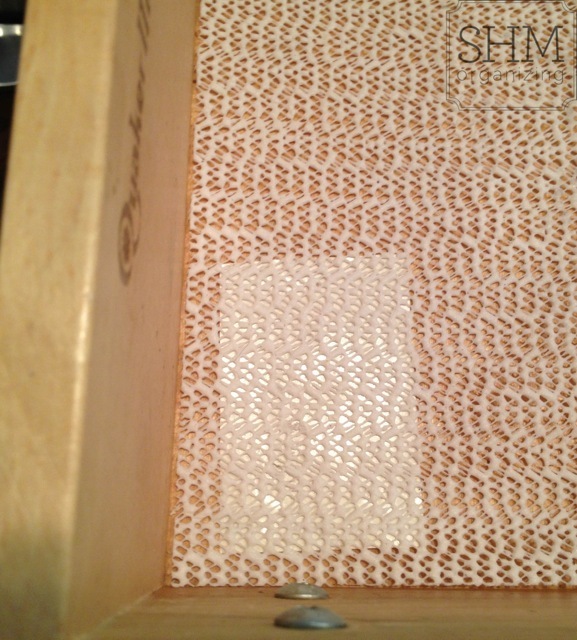 Not only does this product hold the corners of your rugs in place, but it also doubles as a very reliable liner-locker! 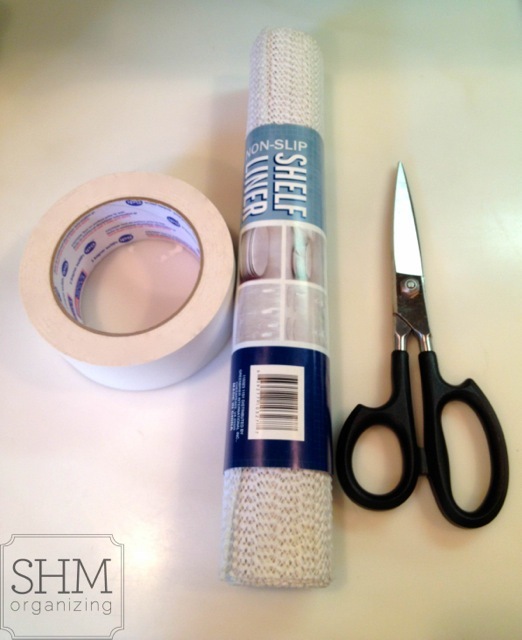 Carpet tape keeps your shelf liners in place and can be removed with a little effort without damaging your cabinetry. So for just a few dollars, you too can enjoy this LCHI benefit! Voila! And you can't even see the tape! 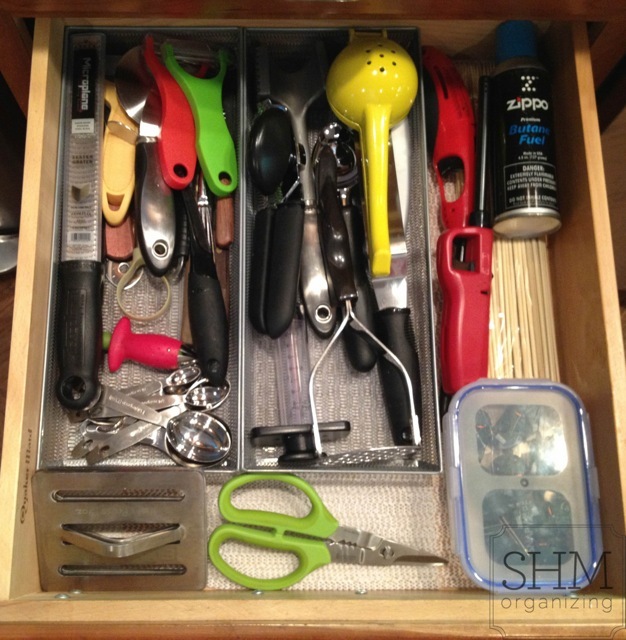 Using multiple drawer organizers will also help slow-the-roll of your utensils. Finally, on a personal note, thank you for the outpouring of well wishes since I launched SHMorganizing. I am having so much fun, and I couldn’t do this without your support and encouragement. I am forever grateful! 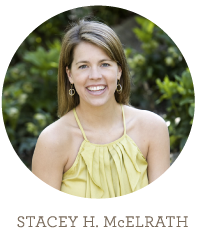 Birmingham-based professional organizer, Stacey McElrath, helps clients throughout Alabama and the southeast clear clutter and establish customized systems to maintain order in their homes or offices. Contact SHMorganizing today for more information: info@SHMorganizing.com. Hello! Welcome to my blog where you'll find all things organized. My goal is to inspire you with organizational tips, tricks, and pics from my client projects, latest research, product breakdowns, and everyday encounters.